Written by Kavanaugh begins Congress tour, selling himself for courtBy LISA MASCARO and CATHERINE LUCEY, Associated PressWASHINGTON (AP) — President Donald Trump&apos;s Supreme Court nominee, Brett Kavanaugh, mapped out strategy with Republican leaders Tuesday, launching a fierce confirmation battle that could remake the court for decades and roil the midterm elections in the meantime.Kavanaugh, a favorite of the GOP establishment, first huddled with Senate Majority Leader Mitch McConnell of Kentucky. He was then meeting with Sen. Chuck Grassley of Iowa, the Judiciary Committee chairman. Joining him were Vice President Mike Pence and former Sen. Jon Kyl, seeking the GOP backing he will need to be confirmed in the divided Senate.Republicans have reacted positively to Trump&apos;s pick, but McConnell has little margin of error in the final vote unless a few Democrats can be brought onboard. Republicans hold a slim 51-49 Senate majority, and pressure is mounting on Democrats from states that Trump won in 2016 to cross party lines for support.McConnell called Kavanaugh "one of the most thoughtful jurists" in the country and blasted Democrats as "eager to try and turn judicial confirmations into something like political elections." The GOP leader warned against engaging in "cheap political fear-mongering. ""We&apos;ll hear all kinds of fantastic stories about the pain and suffering that this perfectly qualified, widely respected judge will somehow unleash on America if we confirm him to the court," McConnell said.Pence called Kavanaugh a "good man. "Democrats are uniting behind a strategy to turn the confirmation fight into a referendum on conservatives&apos; efforts to undo abortion access and chip away at other health care protections under the Affordable Care Act.Senate Democratic leader Chuck Schumer of New York is vowing to fight the nomination "with everything I have. "Schumer warned, "In selecting Judge Kavanaugh, President Trump did exactly what he said he would do on the campaign trail — nominate someone who will overturn women&apos;s reproductive rights and strike down health care protections for millions of Americans. "Trump chose Kavanaugh, a solidly conservative, politically connected judge, as he seeks to shift the nation&apos;s highest court ever further to the right.A product of the Republican legal establishment in Washington, Kavanaugh, 53, is a former law clerk for retiring Justice Anthony Kennedy. Like Trump&apos;s first nominee last year, Justice Neil Gorsuch, Kavanaugh would be a young addition who could help remake the court for decades with rulings that could restrict abortion, expand gun rights and roll back key parts of" Obamacare. "In a prime-time televised announcement Trump called Kavanaugh "one of the finest and sharpest legal minds of our time. "With Kavanaugh, Trump is replacing a swing vote on the nine-member court with a staunch conservative. Kavanaugh, who serves on the Court of Appeals for the D.C. Circuit, has taken an expansive view of executive power and has favored limits on investigating the president.Speaking at the White House, Kavanaugh pledged to preserve the Constitution and said that "a judge must be independent and must interpret the law, not make the law. 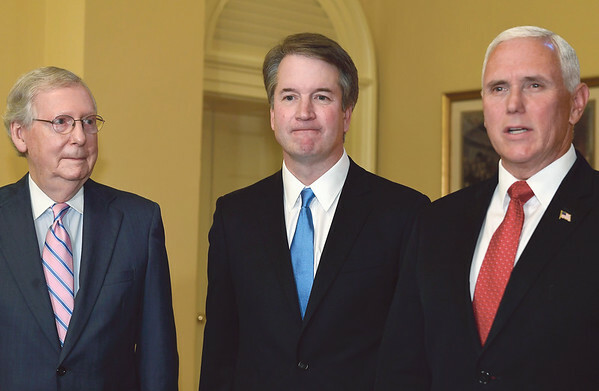 "Some conservatives have expressed concerns about Kavanaugh, questioning his commitment to social issues like abortion and noting his time serving under President George W. Bush as evidence he is a more establishment choice.Some conservative and libertarian-leaning activists were disappointed by the pick and doubted it would provide Republicans with the midterm election boost they are looking for to motivate voters to the polls. "This is going to give heartburn to some conservatives," said Brian Darling, a former Republican counsel to Sen. Rand Paul, R-Ky."It&apos;s not the pick conservatives had hoped for," Darling said.Paul was among some Republican senators who had favored other options. But the senator tweeted after the announcement that he looked forward to meeting Kavanaugh "with an open mind. "With Democrats determined to vigorously oppose Trump&apos;s choice, the Senate confirmation battle is expected to dominate the months leading up to November&apos;s midterm elections. It typically takes about two months to confirm a justice.Democrats have turned their attention to pressuring two Republicans, Sens. Susan Collins of Maine and Lisa Murkowski of Alaska, to oppose any nominee who threatens the Roe v. Wade Supreme Court decision. The two have supported access to abortion services.Kavanaugh is likely to be more conservative than Justice Kennedy on a range of social issues. At the top of that list is abortion. A more conservative majority could be more willing to uphold state restrictions on abortion, if not overturn the 45-year-old landmark Roe v. Wade decision that established a woman&apos;s constitutional right.Like the other eight justices on the court, Kavanaugh has an Ivy League law degree, spending his undergraduate and law school years at Yale. Since 2006, he has been a judge on the federal appeals court in Washington. He also was a key aide to Kenneth Starr during Starr&apos;s investigation of President Bill Clinton, worked on behalf of George W. Bush&apos;s campaign during the election recount in 2000 and served in the Bush White House.Kavanaugh&apos;s many written opinions provide insight into his thinking and also will be fodder for Senate Democrats who will seek to block his confirmation. He has written roughly 300 opinions as a judge, authored several law journal articles, regularly taught law school classes and spoken frequently in public.Kavanaugh&apos;s views on presidential power and abortion are expected to draw particular attention. Drawing on his experience in the Clinton investigation and then in the Bush White House, he wrote in a 2009 law review article that he favored exempting presidents from facing both civil suits and criminal investigations, including indictment, while in office. That view has particular relevance as special counsel Robert Mueller is looking into Russian meddling in the 2016 election and whether the Trump campaign played any role in a foreign interference plot.___Associated Press writers Zeke Miller and Mark Sherman contributed to this report. Schumer warned, "In selecting Judge Kavanaugh, President Trump did exactly what he said he would do on the campaign trail - nominate someone who will overturn women's reproductive rights and strike down health care protections for millions of Americans." Trump chose Kavanaugh, a solidly conservative, politically connected judge, as he seeks to shift the nation's highest court ever further to the right. "Brett Kavanaugh has gotten rave reviews - rave reviews - actually, from both sides," Trump said Tuesday as he left the White House for a weeklong overseas trip. "And I think it's going to be a beautiful thing to watch over the next month." Some conservatives have expressed concerns about Kavanaugh, questioning his commitment to social issues like abortion and noting his time serving under President George W. Bush as evidence he is a more establishment choice. With Democrats determined to vigorously oppose Trump's choice, the Senate confirmation battle is expected to dominate the months leading up to November's midterm elections. It typically takes about two months to confirm a justice. Democrats have turned their attention to pressuring two Republicans, Sens. Susan Collins of Maine and Lisa Murkowski of Alaska, to oppose any nominee who threatens the Roe v. Wade Supreme Court decision. The two have supported access to abortion services. Kavanaugh's views on presidential power and abortion are expected to draw particular attention. Drawing on his experience in the Clinton investigation and then in the Bush White House, he wrote in a 2009 law review article that he favored exempting presidents from facing both civil suits and criminal investigations, including indictment, while in office. That view has particular relevance as special counsel Robert Mueller is looking into Russian meddling in the 2016 election and whether the Trump campaign played any role in a foreign interference plot. Associated Press writers Zeke Miller and Mark Sherman contributed to this report. Posted in New Britain Herald, Nation-World on Tuesday, 10 July 2018 18:58. Updated: Tuesday, 10 July 2018 19:00.